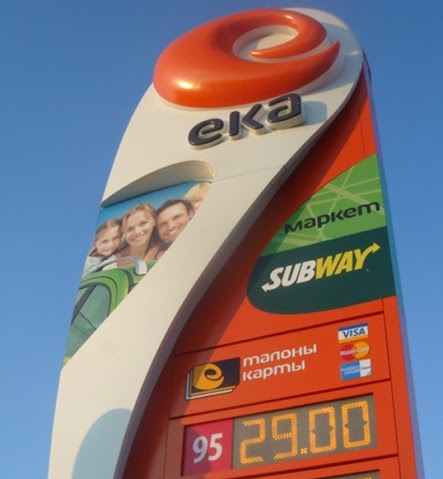 Russian fuel retailer EKA was founded in 1997 and today it manages a small network of 58 filling stations within Moscow and its vicinity.  With just 8% market share of the total gas stations in Moscow how could Minale Tattersfield help EKA build brand visibility in a landscape dominated by the big three? 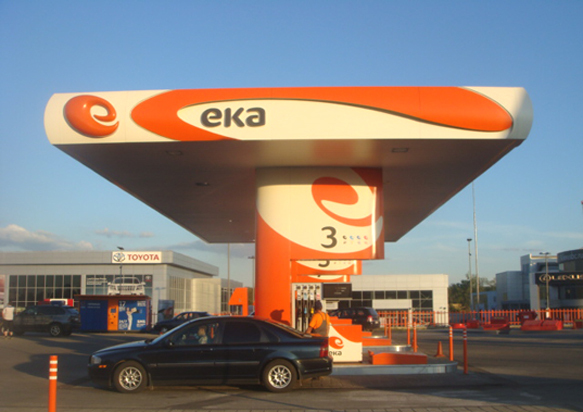 Up and until 2010, EKA had been operating its downstream activities as a franchise dealership applying Rosneft, Gazpromneft and Lukoil trademarks to sell fuel. Around this time, the big oilco brands chose to switch strategy to dealer-ownership. With EKA's 5-year franchise agreement with Rosneft about to be terminated following a bloody nose, the company needed a fresh new start. 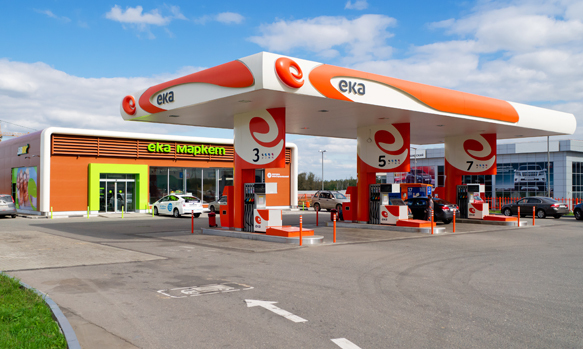 Under new strategic direction, the Russian company chose to unite its entire network under the single brand of EKA and appointed us to create a new visual identity and state-of-the-art look for its external forecourt, carwash, c-store building and interior. Our design challenge was to give the network an extraordinary look to attract upwardly mobile Moscovites. Modernisation of EKA's network is now underway. The corporate identity will be applied to 17 retrofits and three new stations over the next 3 years and will see the company ramp up its related business activities (car cleaning, shops, cafes, ATMs). The logotype's colour was by no means accidental. The colour differentiates EKA from its competitors – from the red of Lukoil to the yellow of Rosneft and blue of Gazprom/TNK. The letterforms of EKA are quite hard and directional lending themselves to some kind of directional swirly, swooshy symbol going up and down or across. This led us to develop the E symbol to give the logotype more impact and fluidity, and to strengthen the brand's symbiotic association with automotive speed and power. The totem is all strident curves, a blaze of eye-candy endorphin-inducing colour to punctuate the tedious monochrome highway scenery and provide temporary refuge from the stress-inducing traffic congestion. Leading the eye to the E of the logo, the trajectory of the curve is symbolic of the comfort and assurance EKA wants to communicate – the way it wraps around the logo and leads the eye to the various sales propositions, fuel included. At night, the dramatic look is accentuated with low maintenance energy-conserving LEDs to illuminate the forecourt and accentuate the curvilinear design and swirl of the logotype. Like all capital cities a 24/7 environment is an important roadside retail consideration, but nowhere more so than in Moscow, a city that never sleeps! The c-store shop was not just a neglected afterthought but forms an essential part of our prototype design and in the not so distant future a busy social hub for the city's travelling population.